the wilderness, Make straight the way of the Lord!”’ (John 1). A line : so thin it cuts a rock. And yet too frail to carry the smallest piece of dust. I’ve spoken of Mercator and his revolutionary map projection already. Now we’ll take a closer look at some of its virtues. Gerhard Kremer was born in 1512 in the village of Rupelmonde, south-west of Antwerp, in Flanders, a part of today’s Belgium. We know him by his professional name: Gerardus Mercator. The face of the world had long been declared flat, but the Church had recently accepted the idea of globe. Mercator made it flat once more. He foresaw new insight. He knew that only fragments as to the skin of the Earth globe was brought forth. He was always eager to gather information on discov-eries and calculations made by seafarers. But he never got to know too much concerning the other side of the Earth. His concluding maps contained loads of guesswork. What remained to be told was still in a mist, but he must have had a guiding intuition. And he did solve one great problem. Navigare necesse est; vivere non est necesse. ‘Navigation is important; living is not’. It was a time when the seas were the main means for communi-cation and the predominant gate to knowledge. Survey was immensely necessary; mapping was the art of its notation. 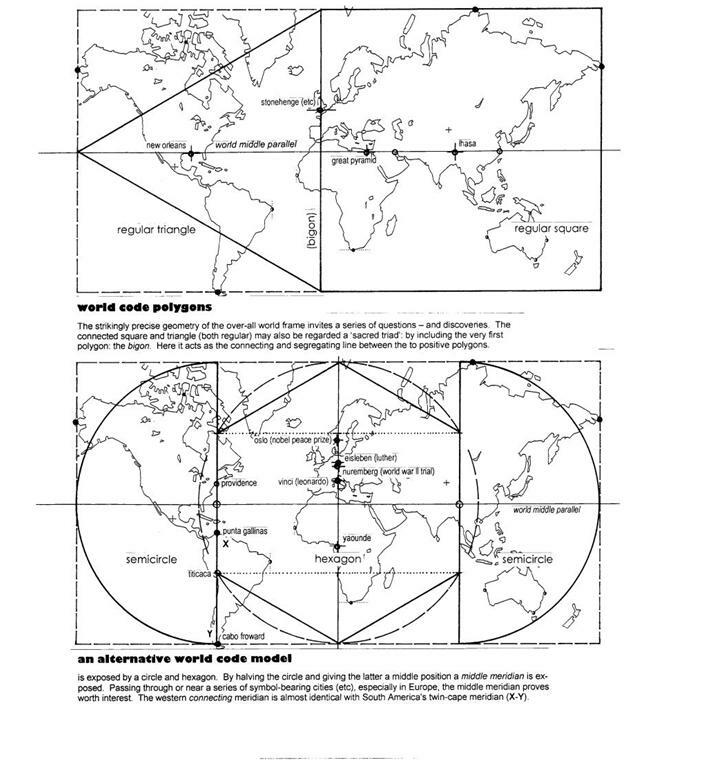 By his revolutionary world map projection he translated the round Earth surface into a plane sheet. The Mercator map’s most essential capacity is that all directions are true. Soon it was acknowledged as perfect for navi-gation. 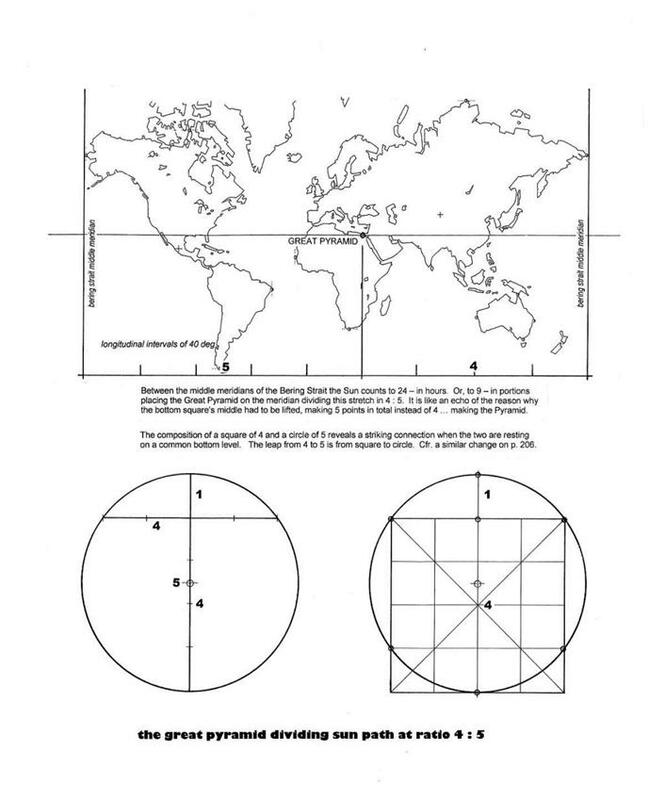 At any point of both globe and map ‘north-east’ would corre-spond a 45 deg angled line from due East. It proved to be more than a navigation aid. It was a revealer of stories. Mercator enters this book because his ‘world image’ allows for a series of discoveries he himself couldn’t make. At present it is possible. The entire planet is surveyed and mapped to an extent he couldn’t imagine possible. The gorge between the wind-driven ships of his time to the satellites of ours is immense. A most extraordinary discovery, however, was that these map stories reveal a close relationship to those of the Great Pyramid, sacred geo-metry … and the Yeshúan perspectives. Any area may be inscribed by its framing meridians and parallels. Dry land is different from ocean, however. The latter is one continuous surface, defining any piece of land, however large, as an island. The land invites settling; the face of the water extends the ability to travel. The three greatest land flakes were identified as ‘continents’ due to their limiting, containing, and developmental abilities. In the following the imaginary frame-lines – always making a perfect rectangle on the Mercator map – will be a key to further observations and discoveries. Focusing on the continents we’ll have to disregard islands, and also the entire area of Antarctica. What we then discover is indeed startling: All three continental frames reveal the very same proportions on the map. America’s long dimension is north-south; the eastern continents’, east-west. The proportion is known from other areas of observation. Firstly, it is equal to the relation of the measurements across of a circle and a square having equal perimeters. Secondly, the proportions of the Great Pyramid reveal the same ratio. The continental code is thus expressed in the Pyramid. A quite stunning discovery. Not least because of the conclusion: that the divine proport-ions of the Pyramid was not invented by initiated pharaohs or ingenious architects. But by the Creative Mind that formed the face of our World. In other words still, the World image is a product of a creative Source, also possessing the power to make real its projects. And, to imbue this opus with a proper signature. After changes throughout billions of years the planet’s pulsating skin has matured for a next step of observation: the Diamond Code. The term is borrowed from the realm of cards; the rhombic shape of the ‘diamond’ gives a natural association. Collecting all three continents within one embracing frame gives us another striking and very precise picture. 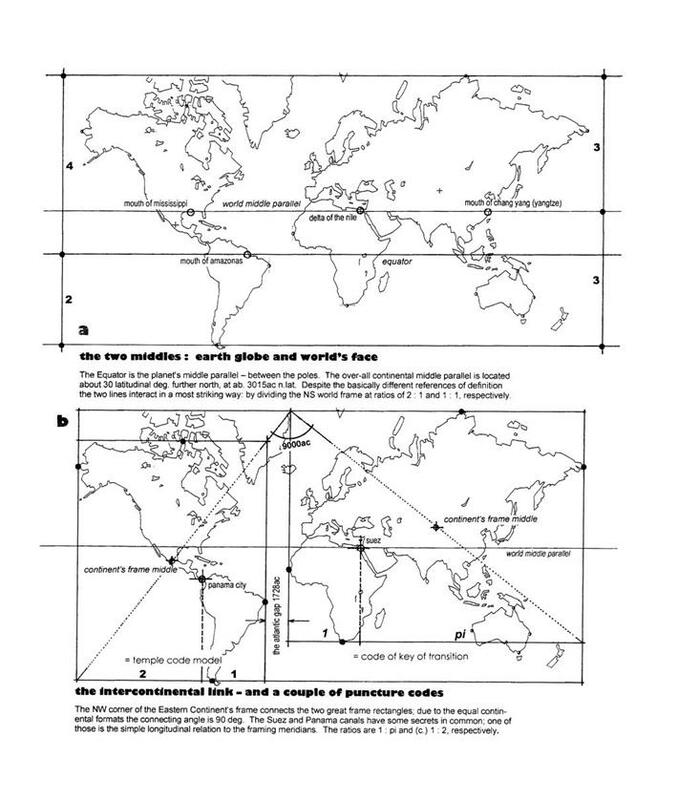 The map frame of the Atlantic-centered world has a format of 1.866 : 1. The ratio reveals that the two first regular polygons, a triangle and a square, fill this world frame with perfection. Does the connecting meridian have some special secret? It does, indeed. An eastward triangle makes the line pass near Athens. The opposite position shows the same line passing Stonehenge, Avebury and Silbury Hill. Thus, sacred places from past eras collect at the divid-ing meridian … witnesses of a will to observe and understand the mys-teries of time and place. In our day the display of ‘crop circles’ adds its own points to this divide ( p. 46). The proportion refers to a geometrical Sacred Triad – a composition of bigon, triangle and square. The shape (upper left) is crystalline yet com-posite, ambiguous – as if contemplating a built-in story of its own. I’ve named it the ‘World Crystal model’. The fact that the Earth’s face shows such precise connections to geometric simplicity is still, after thirty years of study, an almost shocking knowledge. 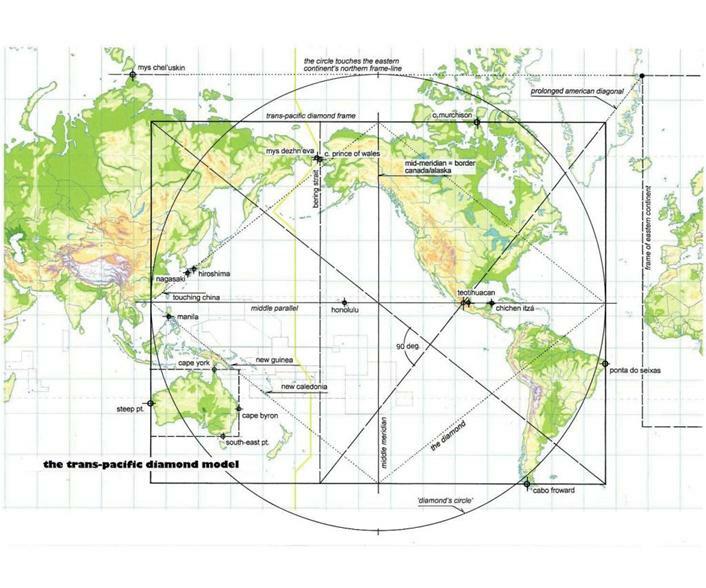 The triangle’s free point marks the model’s latitudinal middle – but far north of the planet’s middle, the Equator. The position is about 3015aa n.lat. Although marking a latitudinal level on the globe that divides the polar axis at a ratio of 1 : 3 ( p. A-66), the Great Pyramid serves as a symbol of middle! 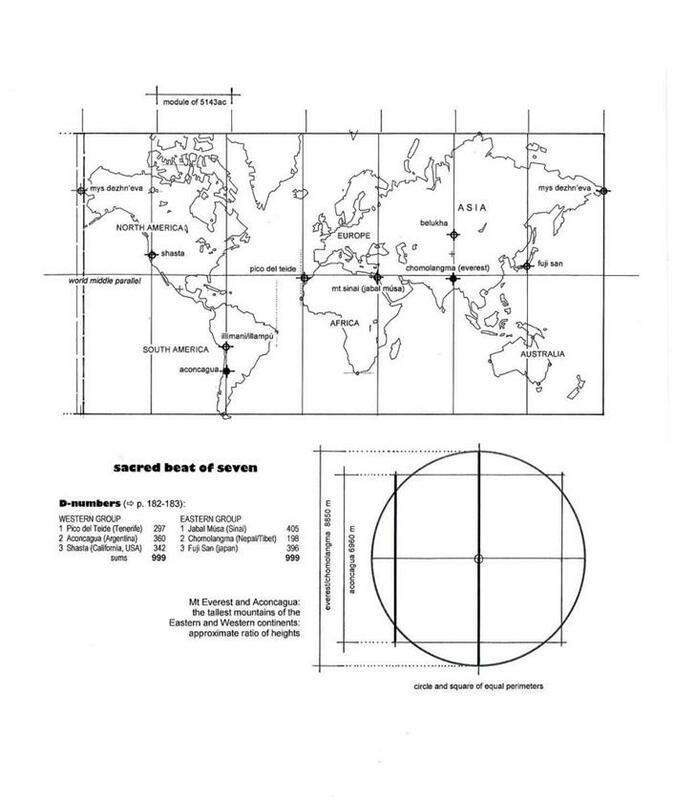 The hexagon’s connecting western meridian we find near a most peculiar phenomenon: the South American ‘twin-cape meridian’ (connecting north and south capes; a similar feature is exposed in Asia;  p. 24). The entire figure seems an expressive, informative yet secretive symbol: It is as if the original, complete circle has parted, as if accepting, declaring, letting free and guarding its own inscribed hexagon. Like an egg-shell accepting to break – and expose its possible treasure ( right). The temple candlestick of seven lamps was more than just that. Now a ‘candelabra’ of seven sacred world-markers calls for attention. They even divide Earth’s twenty-four-hour day in seven. A series of six famous mountains starts and ends near the shores of the Pacific Ocean: Japan’s Fuji San and California’s Shasta. Next to the two we find the tallest peaks of each of the two great continents, Mount Everest (Sagarmatha; Chomolangma) of the Himalayas, and Aconcagua in the Andes. At both sides of the middle Mt. Sinai (Gebel Músa) and Pico del Teide of Tenerife serve as markers. The legendary Gora Belukha of Altai goes with Mt. Everest, and Illampú and Illimani, with Aconcagua. The seventh marking seems to be missing, however. It may possibly be another kind of ‘mountain’: Mys Dezhn’eva, the very east cape of the eastern continent may complete the heptagonal rhythm. This ‘different mount’ doesn’t expose an upward will-of-existence like the other six. It faces East – thus starting the entire series by greeting the rising Sun. Studying the angular division by seven more closely, we find Har Merón to be a competitor. In the present study it is identified as the very Mount of Transfiguration. Thus it may stress the very connection between the missions of Moses and Jesus. If so, these two mountains of revelation interrelate in order to explain a corresponding yet spiritual interrelation. Integrated in the great rhythm of mountains of sacredness, they are organs chosen to reflect an unseen Heaven and greet an unseen Sun. Do they represent a third alternative, a different lamp, referring to the unseen Source. Are the four longitudinal western intervals a plus-One signal added to the eastern three? Does the wandering Sun count to three, and then add the remaining four to conclude at seven? (The Great Pyra-mid divides this same span at a ratio of 4 : 5, being 4 : (4+1) ( p. 32). The map of Mercator is laden with secrets waiting to be laid open. 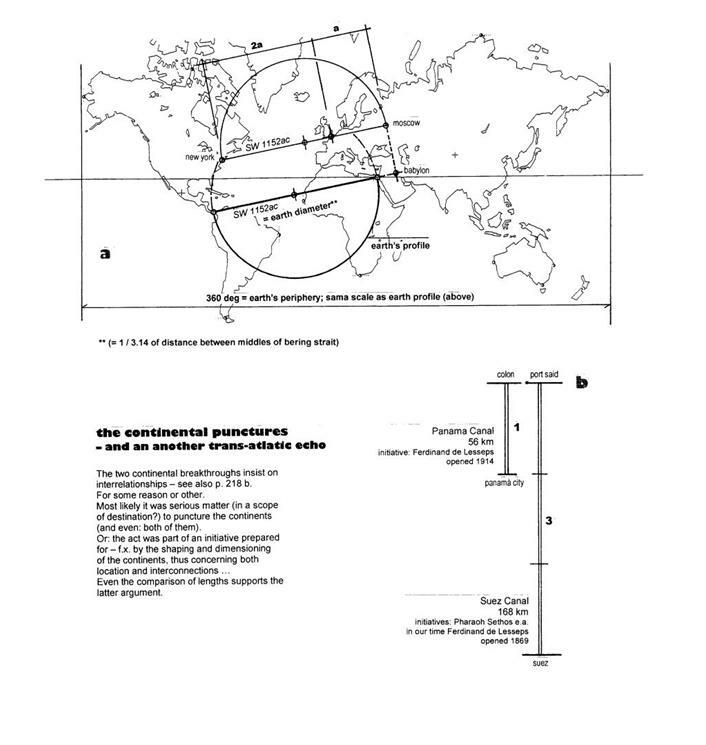 The Greenwich prime meridian got its sophisticated role in 1851. Its position is defined by the central axis of the old Royal Observatory, coming into general use as a result of British hegemony on the seas. Reading the Earth we soon find more self-defining zero markings. The most distinct is the Bering Strait, a gap of 156ac separating Asia and North America. Many map analyses show that this strait – either by its middle meridian or by the East Cape of Siberia, the Asian cape greeting sunrise – is a key to riddles referring to the daily path of the Sun. I’ve mentioned the South American two-cape meridian. There is yet an-other: the one connecting Asia’s north and south capes, Mys Chel’uskin and Tandjung Piai. Only a gap of about half a degree separates their individual meridians – over a distance of 8 500 km, or 76.5 deg of latitude. The moment when the Sun passes the very middle of this meridian gap it divides the entire day’s round at the exact ratio of 1 : pi, start and end being the middle meridian of the Bering Strait. The precision is total; it explains the Bering Strait as Earth’s own time origo. The Key explains that the initiating circle as well as its stretched out periphery had to be exposed. The solar round is not only a totality of 24 hours or 360 degrees, but one where absolute (1) and relative (pi) appear together, thus making the day a sacred parable. Another example shows us how this same totality was made able to ex-plain the longitudinal position of the Great Pyramid. Dividing the whole round in nine equal longitudinal modules, we find that the Sun passes the site of the Great Pyramid at the very moment when the first four modules are made. From here onward, five modules remain (⇨ p. 32). We have seen already a few examples of such a change from 4 to 5; not least explained as the zone above the head of the sitting human body. The Superior Crown added an extra plus-One to the four height modules. The Pyramid expresses the very same idea. Its four bottom points were not able to make it on their own. A fifth had to be exposed – and lifted: to produce the volume. Earth’s own zero, the Bering Strait, had initiated another: the Pyramid. 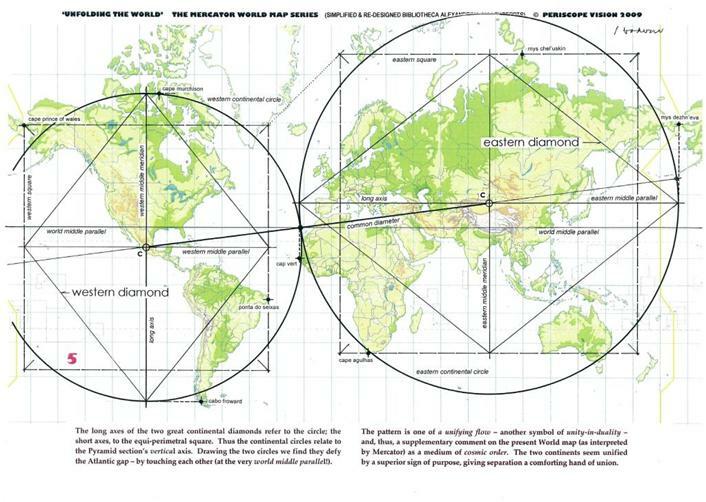 The continental ‘Diamond Code’ is defined by a circle and a square of equal perimeters. All three continents agree. Even Europe does, despite the fact that Europe is no continent. It’s but a west-ward peninsula of the Asian body, stretching out to be cherished by the Gulf Stream and the moods of sunset, and to benefit from the potentials of variation – of nature and culture, mentality and skills – within short distances. The attributes awarded Europe often resulted in damage and exploitat-ion of neighbours, near and far. Still Europe is no continent. 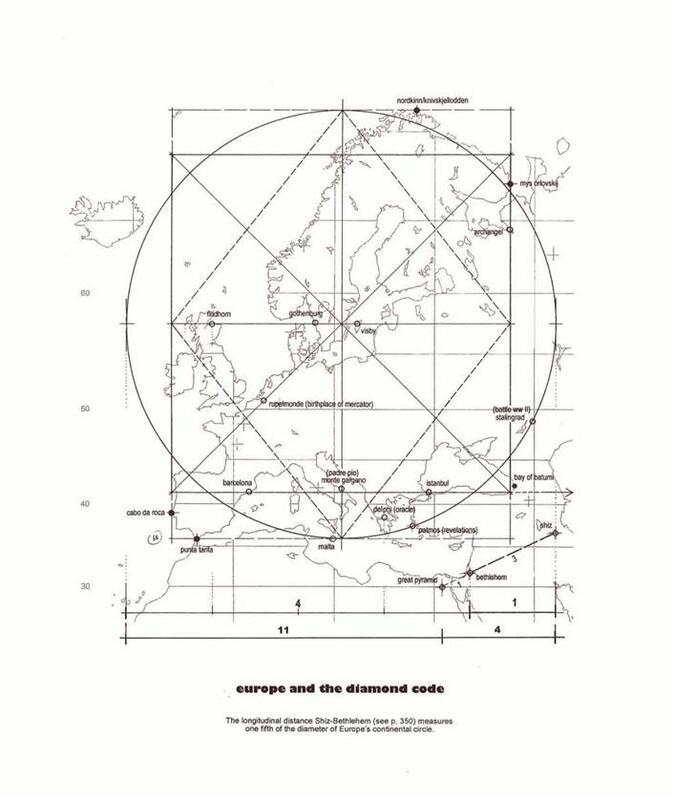 The reason for the Diamond Code to ‘accept’ Europe may be some cosmic purpose of assignment. Neither Africa nor the Americas show a similar self-explain-ing sign-of-capacity. Europe’s north, west and south capes are easily found: the Norwegian Kinnarodden, Portugal’s Cabo da Roca, and Spain’s Punta Tarifa. The only possible east cape making sense is Mys Orlovskij, situated on the pen-insula of Kola ( p. 40). The north and east capes of Africa – Tunisia’s Rass ben Sekka and Raas Haafuun of Somalia – define two of the frame-lines. Cabo Froward near Tierra del Fuego and Ecuador’s Punta Pariñas complete the frame. In spite of the vast Atlantic waters separating the two parts the adapt-ation to the Diamond Code ratio is perfect. In addition, the dimension of the gap between the two continents, defined by their individual frames, exposes an astonishing figure, measuring 1728ac. This basic number of the Pyramid’s sacred triad is a perfect cube, 12x12x12, a fully self-realized 12 – the numerical symbol of World and humanity. So, how explain this mystical union – now even adorned with a signature of distinct symbolism. The primary explanation is still that cosmic laws prefer spiritual incitements for material. Yet another example craves to be observed, however. One last diamond is even more breath-taking, though. In addition, it fulfills the picture of a world linked together in a continuous chain of overlapping diamonds ( p. A-06). The frame figure that combined Africa and South America by including the Atlantic gap was an introduction to a next and concluding exposition: its Pacific counterpart – the frame composing America and Australia. Even that a perfect Diamond. The Bering gap is only 1/11th of the Atlantic, measuring 156ac. Still the geometric perfection of this immense span seems all too fantastic to even get hold of. America’s north, east and south capes define three of its dimensions; the American Diamond is thus included in this new frame. The west cape of Australia completes the format. We draw the Diamond. Its outline touches the coasts of China and New Guinea, and New Caledonia seems a precise, affirming sign. The targets of the nuclear bombs that killed World War II, Hiroshima and Nagasaki, offer their own harsh comments to the key term ‘pacific’. And still, this incredible yet perfect model does seem sort of pacifying. One striking feature is that its middle meridian matches the border between Alaska and Canada with precision. Another refers to the geometry of the very Diamond format, defined by the interplay of a circle and a square of equal perimeters. The Diamond’s long axis refers to the circle. Inserting this circle we find its northern lati-tudinal tangent being indicated already: it is the latitude of Siberian Mys Chel’uskin, and thus, the marker of the northern frame of the entire East-ern Continent. The fact that the spectacular transpacific Diamond connects to three of the other diamonds stresses that all these equal signatures are a family; they belong together, pronouncing one unison message: of a gigantic exposition, not of coincidence, but of purpose. Which purpose? The one witnessing the Source: the running-over spring of illuminating surprises. A creative initiative revealing the nature of our true Home. We are children of a world of Diamonds. Signs of the most holy Pact. One theme discussed in the first volume of The Periscope, was the continental punctures: the Suez and Panama Canals, and their possible signals of meaning. The map distance between them proved exactly one Earth diameter, 1/pi of the total length of the longitudinal 360 deg. Thus, these artificial cuts into Mother Earth’s bodies of land, meant to serve economic and military purposes, may also express a kind of agreement … with the planet. More poetically: a preference of water is exposed. The given unity of dry land was replaced by a zip. Both great continents had become catamarans: two main hulls and their outriggers. The straight map line connecting Panama City and Suez has a direction of about EN 1152ac. Further north, a line having the very same direction and length connects the metropolises New York and Moscow. London, also being on this line, divides it at an exact ratio of 1 : 2. We’ll be observing other aspects concerning this northern line ( 18). At present the canal theme has its own revelations in store for us. The length of the Suez Canal is about 168 km, while the Panama Canal is about 56 km. The eastern zip is three times that of the western. Thus, a supplementary code of the East-West connection shows up. The Panama Canal is the very module. Trying to find some key to an understanding of the given dimensions, I got a possible answer when adding the two lengths. The sum is 224 km, or 435 060 uc. Intuitively I divided this dimension by (pi+1)4 (cfr. the universal modulator, pp. A-108ff). The num-ber appearing was 1478.7 uc, almost exactly equaling the level figures of Bethlehem and Golgotha, 1476 uc, a Yeshúan and, also, a Marian symbol. Using instead 1476 uc as basic unit, the Panama version would measure 369 uc (corresponding 167.7 km); the Suez, 1107 uc (corresponding 55.9 km). 369 uc is the vertical fall of River Jordan. The total length of 1476 uc refers to the above data. The ‘diving’ mirror of the Great Pyramid may belong, too (A-220, 222). And, if so, the symbolism of descent and baptism – even of a punctured, sacred body. “Father, forgive… they don’t know what they’re doing!” Was the puncture of continents an act of unconscious sacrilege? Accepted by Mother Earth – or performed against her will…? As the images in the wake of Mercator unfold, lining up arguments whispering of an Eternal Will, the swaying cold front between science and vision may once more be activated. The fact that natural science doesn’t feel at home with the message of the unfolding parables may still seem ‘natural’. Is it just as ‘natural’ that theology often shows the same attitude? Natural science may look for more flexible terms or alternative models. Theology may pronounce some new perhapses, wanting to let things slide by undiscussed, or hoping for re-arranged truths round the curve. The Source is running over, though. I doubt any theology that professes faith without having listened to the teachings of nature. Jesus himself referred to the lilies. I also doubt any science that doesn’t see this divine pedagogy. It is time to look beyond and inhale the given light of insight. And of conviction. The further revelations by the Mercator map are discussed in detail in my book, The Way to the Middle, and in my exhibitions, Unfolding the World and Daybreak Archive. The themes mentioned may be sufficient to expose how this special map projection witnesses the management of the reality beyond. The famous Yeshúan saying, “For God so loved the world … that He gave His One-borne Son.” (John 3). All One-borne gifts are included in this per-spective. Our actual theme is the World. It has been loved from the very beginning and so deeply that innumerable recordings bear witness. The Lover’s caresses are all over Mother Earth’s body. The traces insist on revealing His true identity. Not all Yeshúan aspects were to be mediated by the narrators of gospels and other verbal reports and comments. Even the inspired words are words. Other perspectives always need supplementary media. In the inserted study, ‘Potters and fishermen’ (22), this aspect is articulated further. The swaying front between the words and the wordless always has its hiding traps, however. The Diamond Code, defined by the interplaying dimensions of a circle and a square of equal diameters, has yet more in store for us. The diamond’s long axis is defined by the circle’s diameter. The short, by the square’s measurement across. The frame rectangle’s ratio is about 1.27 : 1. The longitudinal gap of 1728ac separating the frames of the two great continents, seemed to insist on some kind of connection. The gap was real, but the very number of the gap’s size was, too: 1728. The long axes, by referring to the circle, sort of demand the circles to be exposed. Not only a gap defined by continental frames, but also the symbols explaining these images as symbol-bearing geometry, insist on a right to include hidden yet built-in stories. I drew the circles. Immediately a new story revealed itself: The circles advocated the explaining away of the gap. They had met – touching one another at a certain point. No gap between them, and no intersection, just this slight yet precise touch. As far as my two-meter map could tell. To excess, the point of touch was located on the very mid-world parallel! Quite exactly right north of Tenerife’s Pico del Teide. Thus, the two connecting circles make a great figure-of-eight. And thus, also an image of a kind of flow. As if the separated East and West do (or shall, or must) belong together, communicate and interact. Don’t we observe here a great symbol of unifying purpose, a breathing flow of energy (or how name it?) that incessantly pulsates, making the two great continents display a new yet ageless secret – of oneness? The secret has been concealed by a vast, dividing ocean. It was quest-ioned, however, by the minimum gap and its Great Pyramid number, 1728. And now, at last, revealed by the joining circles. So, our World is granted a most expressive image of Oneness, the Dia-mond Code acting as its precious indicator: Duality and unity exposed as independent yet interwoven qualities in one lucid World Concept. Only abstraction was able to reveal this message of unity. And thus, not to be interpreted as the opus of uniforming power, but of the powerful pulse of interplay and love. World unity is indeed a spiritual phenomenon. The double loop of connected circles soon revealed an additional point. The ratio between the two diameters proved to be √3 : √2. Thus, the areal interrelation is 3 : 2 – not only of the circles but, also, of the continental frame rectangles, whose areas equal those of the circles. Asia, Africa and Europe made 3. The two Americas, 2. But names (or more or less defined flakes of land) were hardly apt to explain this mathematical precision. Some other explanation ought to show up. One possible aspect was the sum of 2 + 3. Five. A symbol of fulfillment announced and explained to the full by and in the Great Pyramid. Another aspect, the difference: 3 minus 2. One. Was the symbol ‘One’ present as a sign of difference – in order to explain the nature of the quality uniting the two? Or did this ‘One’ explain a quality being absent – to be added in order to complete the story? If so, a possible Sacred Triad could be the answer. I deduced the circle having a diameter of √1 (= 1) which, consequently, also would have an area of 1. The key to the Triad was found. But where would this One-circle fit in? Despite a couple of quite matching dimens-ions here and there the positioning of such a circle seemed meaningless. No Atlantis or Mu (Lemuria) would ever reveal if this very first of con-tinents had been real and then disappeared. What seemed more to the point was if it be an abstraction – like the very circle, as its representative symbol. 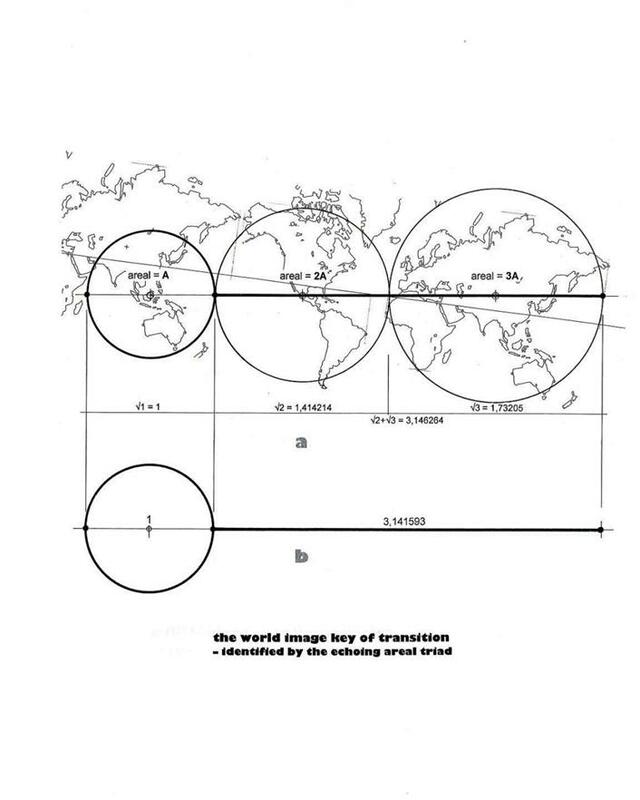 Maybe it even could be a circle itself, and no continent – a purely mathematical symbol, only referring to the other circles and thus engaged to complete this fantastic picture: as a ‘world parable’. I chose this last argument, making the 1-circle continue the row of the 2- and 3-circles, along the common central axis. The 1-circle’s centre now ended at Kalimantan (Borneo), the great enigmatic island under the very Equator, housing the last rain forest people ever spotted by cameras. The circle almost reached the east cape of Africa; its center touched the meridian of Australia’s west cape. Still, no convincing sign showed that the 1-circle has found its proper explanation. What I observed, was nothing less than an immense Key of Transition. In other words: another ingenious message of superior purpose. 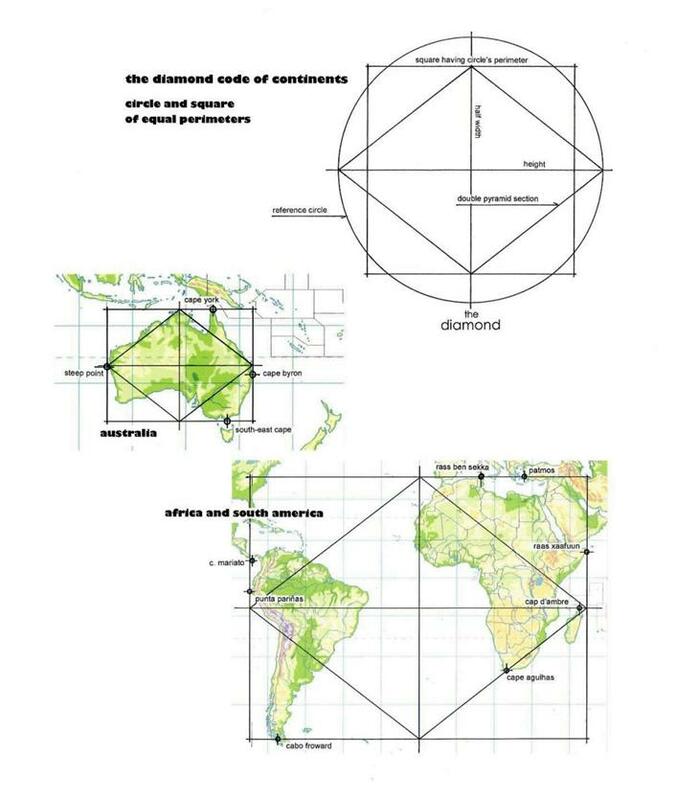 I had observed the continental formats having the Diamond Code figure in common. 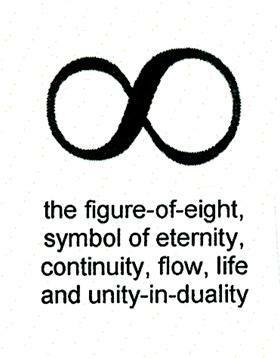 And a figure-of-eight flow that demonstrated a principle of unity in duality. Now, the Key of Transition aimed to stress and explain their combined meaning. In other words: the two great, physically exposed land flakes were inter-related, separated, linked together and dimensioned according to a superior purpose: the exposition of the One-symbol, explaining all, by one single, including image. The Key. The ‘original continent’ needn’t – and could simply not – have the nature of the two others. In order to explain the nature of the creative Source it had to be physically absent. Which was the very way of its presence. “For God – the One – so loved the World…”. That He gave it a complete set of His One-borne signatures. Like He made the Sabbath a separate Time unit to make His signature seen (by addition), He made the World a sacred triad: to make His signature seen (– also by addition). The dimensions √1, √2 and √3 had been chosen to dimension this totality – a global phenomenon made legible via a discovery made by a Fleming of the sixteenth century – who never came as far as even to dream of it being possible. 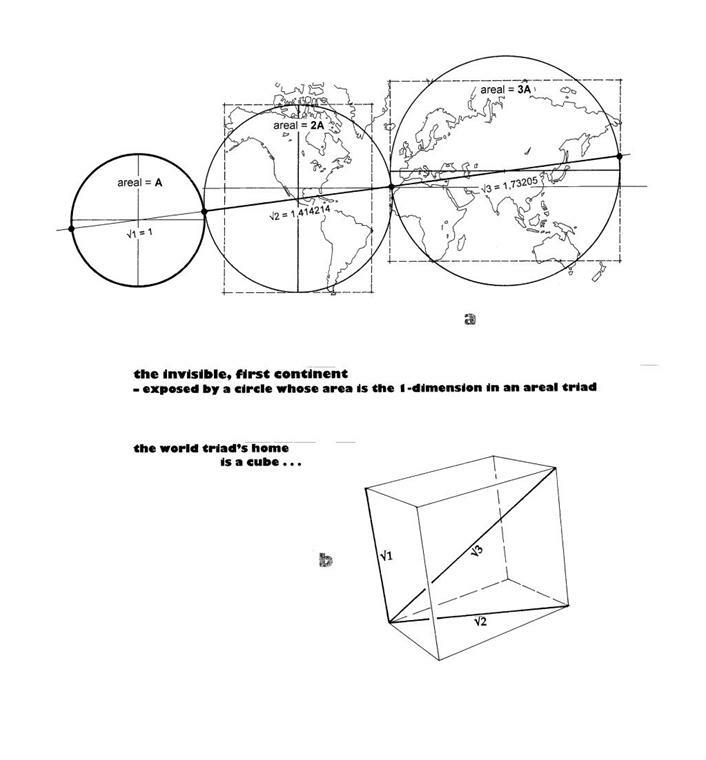 √1, √2 and √3 … the three dimensions referring to the geometry of a cube! A side’s length, its diagonal, and the volume’s spatial diagonal. A step-wise articulated sequence spanning minimum and maximum. And the added two longest dimensions are pi times the short. Listen, babies: The cubes you’re playing with are a key to this World of ours, given us by the Circle. Your hands cherish a wonder. Be happy! From a most ‘incredible’ cosmic sweep we’ve landed in a playpen. We observe the traces of a most important celestial initiative, expressed by the Circle that chose to burst – to become instead of remaining absolute, closed and inactive … to be relative and to relate. This is the World’s built-in and very true explanation-of-existence. The unseen image of Being exposing itself by a Becoming made seen.